LEXINGTON, Ky.– As temperatures remain dangerously low at the beginning of the new year, the Lexington Fayette County Health Department wants to encourage you to take precautions if you find yourself outdoors. During the cold weather, stay indoors whenever possible. 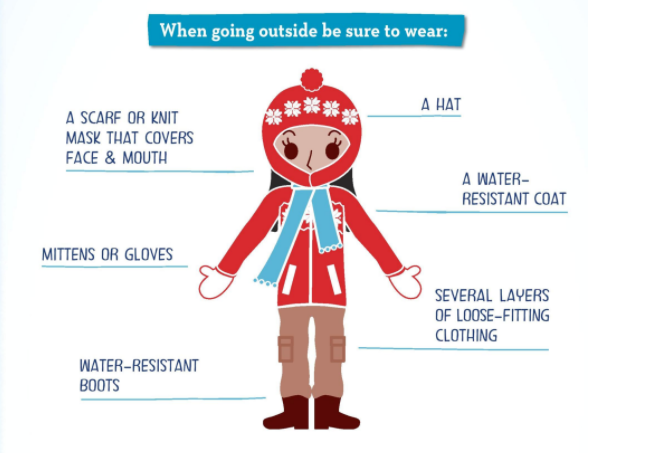 However, if you must go outside, dress warmly in layered clothing, including a hat, scarf or knit mask to cover your face and mouth, sleeves that are snug at the wrist, mittens, a water-resistant coat and water-resistant boots. Avoid exertion, as cold weather puts an extra strain on the heart. People with heart disease or high blood pressure should follow their doctor’s advice about shoveling snow or performing other activities in the snow. When outside, avoid walking on ice, and keep your steps and walkways as free of ice as possible. Be on the lookout for signs of hypothermia and frostbite, two common cold weather-related health problems. Warning signs of hypothermia, which is abnormally low body temperature, include shivering, exhaustion, confusion, fumbling hands, memory loss, slurred speech and drowsiness. If you detect symptoms of hypothermia, seek medical care immediately. Get the victim into a warm room and remove any wet clothing. Warm the center of the body first with an electric blanket, if available. Otherwise, use skin-to-skin contact under loose, dry layers of blankets, clothes, towels or sheets. Warm beverages can help increase the body temperature, but do not use alcoholic beverages. Warning signs for frostbite, or an injury to the body caused by freezing, include redness or pain in any skin area, white or grayish-yellow skin, skin that feels unusually firm or waxy and numbness. If you detect symptoms of frostbite, seek medical care immediately. Get the victim into a warm room, and immerse the affected area in warm – not hot – water. Do not rub the frostbitten area with snow or massage it, as this can cause more damage. Do not use a heating pad, heat lamp or the heat of a stove, fireplace or radiator for warming, as the frostbitten areas are numb and can be easily burned. These procedures are not substitutes for medical care, and all emergencies should be reported to a physician or healthcare provider.